1: Which of the following ancient peoples never settled in Spain? 2: The people that migrated from Gaul to Spain in the first millenium BC and spoke an Indo-Europan dialect were known as the�. 4: What Spanish commodity was brought back in such large quantities that it flooded the Assyrian market in the 8th Century BC? 5: The legendary Spanish kingdom ruled by King Argentonio was known as�..
6: Which of the following modern Spanish cities was originaly founded by Greeks? 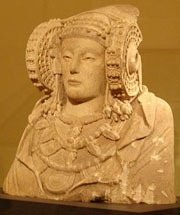 7: This Iberian sculpture unearthed in south east Spain is known as�. 8: The ancient name of the area roughly covering the modern nation of Portugal was known as�. 9: In 226 BC, Carthage and Rome signed a treaty that fixed the boundary of their two territories at�. 10: The ancient Roman city of Caesar Augusta is known today as�.